I made it down to Eugene for the OKCA show on Saturday. Best knife show I have ever seen... about 350 tables and I’d say almost a quarter of those had at least some switchblades if not a lot of them. I picked up about eight new autos including my first Latama. Best of all was first meeting Rainy Vallotton and getting to talk to him for awhile (mostly about East Coast mafioso ). 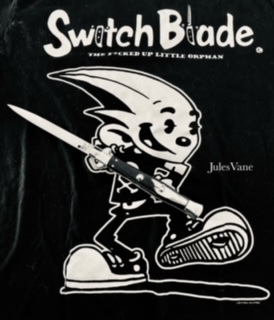 Then was introduced to Neal Punchard and had a long and fascinating conversation with him about the future of switchblade forums, new makers, the age of collectors and all sorts of other switchblade stuff.. I was in heaven. I will definitely try to make both days next year. Very nice ! You did well! Any pictures of the show overall? Mike,looks like you do well at the show,glad that you had a good time,I talked to Neal just a few weeks ago,I will see him at the Mystic show in less then two weeks. Tom19176 wrote: Very nice ! You did well! Any pictures of the show overall? Here’s a couple of the show and some cool knives I couldn’t come close to buying ..
Wow, nice haul, I'm guessing your wallet was a little thinner on the way home, one of these years i hope to get to one of the big shows. Very Nice Score! Awesome Latama...Congrats! I always liked those Medici style Italians. AKC made some nice ones.